During the height of the credit crisis in 2008, silver fell to $9.17 an ounce. And at the time, we couldn't have been more bullish. Silver prices have gone as high as $48.70 an ounce in 2011. At its peak, we're talking about a 530% increase — or a 177% annualized gain — within three years. Even after a correction, silver prices are still up more than 70% from the 2008 low. Simply looking at a chart of silver prices, regardless of how far back it goes, will not capture the whole picture. And there's a reason our editors have been screaming to stock up for close to a decade: This run is far from over. Gold is in a bull market with years left to run, and silver always beats gold. The most important indicator silver investors must understand behind silver beating out gold is the historic gold/silver ratio. The gold/silver ratio is a simple measure of how many ounces of gold and silver equal the same amount of dollars. 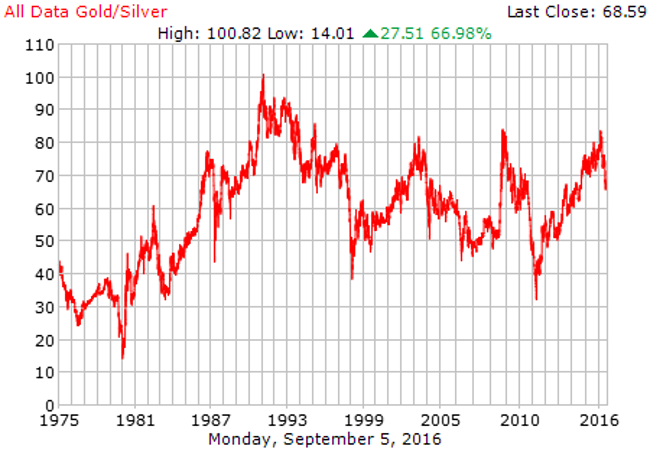 Based on the number of ounces of silver an ounce of gold is worth, this ratio has stayed within a moderate range over the past 30 years. For example, in 1980 an ounce of gold was worth 14 ounces of silver. In 1990 an ounce of gold was worth just over 100 ounces of silver. If you average out the price ratio between gold and silver (how many ounces of silver an ounce of gold will buy) throughout history, you land on a single magical proportion: 16 to 1. Even experts who do not subscribe to fixed pricing relationships generally agree that a price ratio of 20:1 should be considered normal. When combined with the failure of the Federal Reserve's printing press, prices can go much higher. Just look at how the ratio works out in a more current situation. A recent snapshot of gold and silver prices (with gold at $1,345.02 and silver at $19.91; the gold/silver ratio at 67.6) is a great example: A gold/silver ratio of 67.6 is at the high end of the scale. It indicates silver is quite cheap relative to gold, and that silver has much more upside potential than gold. If the ratio were to fall back to 14, as it was in 1980, silver would have to increase over 236.9% to $96.07/oz if gold did not go up at all. Over the long run, the gold/silver ratio will return to its 16:1 average. A vast majority of the price correction will come from increasing silver prices. The reason is simple: When the bull market in precious metals peaks, there won’t be enough gold to go around. But there will be even less silver. Gold and silver mines are running at much different paces: For every ounce of gold produced, there are nine ounces of silver, a ratio of 9 to 1, silver to gold. However, the U.S. Geological Survey reports there are only six ounces of known in-the-ground silver resources for every one ounce of gold in the ground, a ratio of 6 to 1. And the CPM Group reports the total silver available in the world is only 5x the available ounces of gold, a 5 to 1 ratio. Silver isn’t just a precious metal and (unofficial) currency; it's one of our main industrial metals. One of the most conductive substances known to man, the white metal is used in everything from photography to compact discs... to semi-conductors... to medical equipment. Basically, if something is "high-tech," it contains silver. Silver is so heavily used, in fact, that for the last several decades, the world’s total silver supply has barely been able to keep up with demand — even though the 20th century saw historic production increases. Demand ramped up in the last quarter of the 20th century to the point where, silver was in a fully-fledged global deficit for almost two decades (between 1998 and 2007). It wasn’t until the worst economic disaster in three generations that supply finally dropped to below production levels. The world’s total available silver (both produced and hypothetical) is steadily — and irretrievably — decreasing. With demand rising and supply not keeping pace, the silver industry has had no choice but to create new ways for investors to own the metal. For those looking for a wealth-saving hedge, there are a number of silver bullion producers minting high-quality, high-purity coins for minimal premiums over the spot price of silver (all silver coins sell at a premium to their underlying contained silver value). A perfect example of this is the one-ounce Mexican Libertad. Physical coins can be purchased at a number of dealers online, though we have found the cheapest prices through www.apmex.com. (Note: We do not get paid for including this link in this report; it's simply the best source we've found). For those investors interested in riding silver’s imminent rise — but who are looking for something less tangible — there are silver ETFs and silver mining stocks. With the magic ratio currently at such a disparity (67.6:1 vs. 16:1), those moving into silver exploration today stand to make about 2.4x what their counterparts can expect to cash in with a similar investment in the yellow metal. Sounds nice, I know. And the fact is investing in silver mining right now may not just be the most profitable angle to take with this most consumed of precious metals, but also the easiest. Don’t get me wrong; gold will do very well for investors in the months and years ahead. But on a dollar-for-dollar basis, silver is going to blow the doors off gold’s performance. Silver could easily eclipse the metal's 1980 nominal high of $50 an ounce. Metal traders on COMEX currently hold net short silver positions that are near record levels, and which represent nearly a quarter of total global silver supply. Compare that to gold, in which the net short position represents under 1% of the two billion ounces of world gold inventory. That means the net short position in silver is about 24 times greater than that of gold. The world's largest holders of silver bullion account for roughly half of the available 1.1 billion ounces of worldwide silver. So there would only be 235 million ounces of silver available to investors worldwide — including places like India and China, nations that are buying silver in ever-increasing amounts. Combined, they bought about 465 million ounces of silver in 2013. Without existing inventories, that would have eclipsed worldwide supply by 230 million tonnes before anyone else got in the silver game. The Chinese government is teaching citizens the ownership of silver is an antidote to a devaluing the U.S. dollar. And they're right. This has massive implications for the silver market when you consider the 1.3 billion people who live there are rapidly becoming more interested in buying physical bullion —and will continue to do for quite some time and in increasing amounts. And unlike gold, there is little in the way of available above ground silver inventory. The COMEX reports roughly 150 million ounces of silver in inventory. But most of this is already accounted for by those who hold a warehouse receipt. As I mentioned, we expect to see the price of silver top $50. In respect to this, I continue to urge speculators to buy physical silver while it's still easily available to the retail market. 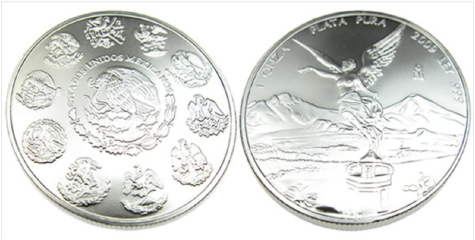 Investments in physical silver — as well as quality silver stocks — will perform very well in the coming months and years. Stay tuned for more more updates on silver and gold, stocks, and plenty of information and market research that will help you and your portfolio thrive.